With all the attention on Avengers: Infinity War right now, it's strange to think that Deadpool 2 comes just a couple weeks after it. In fact, the film comes out just a month from yesterday. This is one I've been waiting for since the end credits rolled for the first Deadpool. That film was such a breath of fresh air for the comic book genre. It spoofed the genre in so many ways, while also being raunchy, funny, and action-packed. It took everyone by surprise, not just with how good it was, but also by how well it did at the box office. It made $783 million dollars at the worldwide box office, which is insane for a low budget, R-rated movie about a (then) obscure comic book character. So, needless to say, it was a win across the board. And I think the sequel will be even better. I may sound crazy for saying that, but everything is pointing to Deadpool 2 being better than the first one. I could be completely dead wrong on that, but right now that's what I'm thinking going into the film. And that's a tall order to fill. With the origin out of the way, Deadpool 2 now has a lot of room to do so many new things, which has been evident in the trailers they've put out thus far. And now we have our third trailer for Deadpool 2, which opens in theaters on May 18. My favorite trailer is still the last one they put out, but this is a great trailer. It touches a little bit more on the story without giving too much away. 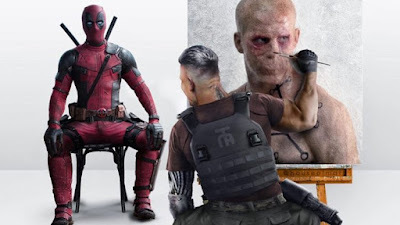 And this trailer focuses a lot more on the X-Force team Deadpool (Ryan Reynolds) assembles to stop Cable (Josh Brolin), which was briefly alluded to in the last trailer. I really like that focus, and I'm excited to see these characters in the movie. I just hope having all these characters don't overshadow Deadpool, and I hope he is given plenty of chances to shine. I love all the fourth-wall breaking moments in this trailer. Deadpool calls Cable Thanos, which is an easy but still funny jab. Then, "From the studio that killed Wolverine" pops up, which was great. Deadpool also says that Cable must be from the "DC Universe", since he's so dark. But I think my favorite of the fourth-wall breaks is at the end when he slices the bullet in half in the same way he did in X-Men Origins: Wolverine. Deadpool then proceeds to slice a whole bunch more, before realizing it doesn't work. While the jabs at Marvel or DC are fun, I like it more when Reynolds pokes fun at himself. The part of the trailer that had me laughing the most was the very end, with Peter. The set-up and delivery of this joke is perfect, with them establishing him having no powers and then he's skydiving in the air alongside the rest of the team. It was perfect. Overall, this isn't my favorite Deadpool 2 trailer, but I really enjoyed it, and I can't wait to see this movie! Less than a month to go! What do you think? Did you like the third trailer for Deadpool 2? Are you planning on seeing the film? Leave your thoughts in the comments section below.